March 17, 2016 January 2, 2017 / Elizabeth T.
Growing up, I was never a big fan of green clothing, not because I didn’t like the color per say, but just that I never really thought to include this shade in my wardrobe (mainly because I was such a girly girl and really just stuck with my pinks and pastels all year round). However, after growing up, I realize how beautiful green is, and I’ve been actively trying to include more and more shades of this gorgeous color in my wardrobe choices! 🙂 I really like dark forest greens and even some royal emeralds, but my favorite shade of green is definitely olive because it’s so versatile and wearable! This olive green utility jacket has been one of my favorites since last fall, and now that it’s spring again, it can make its rightful comeback into my wardrobe since the days are still a bit cool, but it’s not exactly cold anymore. What I love about this jacket is that it can be dressed up for a more sleek and chic look by pairing it with form fitting skinny jeans, but for today, I wanted to style a comfortable, sporty look that’s perfect for those days where you’re just feeling bleh (which is me currently because I can’t wait for the weekend)! By pairing it with a pair of comfortable yet chic joggers and a cozy striped long sleeve tee, I play up the sporty, athleisure style that I’ve been obsessed with currently. To finish off the entire look, I opted for my favorite Nikes, as well as a beanie (borrowed from the boyfriend) and my Polette sunglasses. How are you all celebrating St. Patrick’s Day? 🙂 And are you wearing green on this day as well? Let me know in the comments below! Wow! This look was made for you. You look super chic! Love the army green jacket! 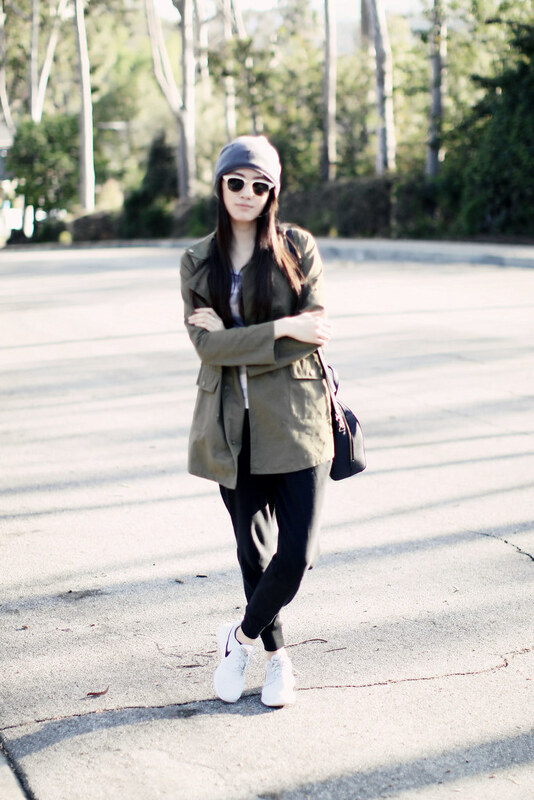 I have a similar olive jacket which I really like! This really suits you well! this is by far my favorite look on you elizabeth! love those beanies!! Haha thank you so much Annie 🙂 ❤ And yes the beanie is so comfy and warm! 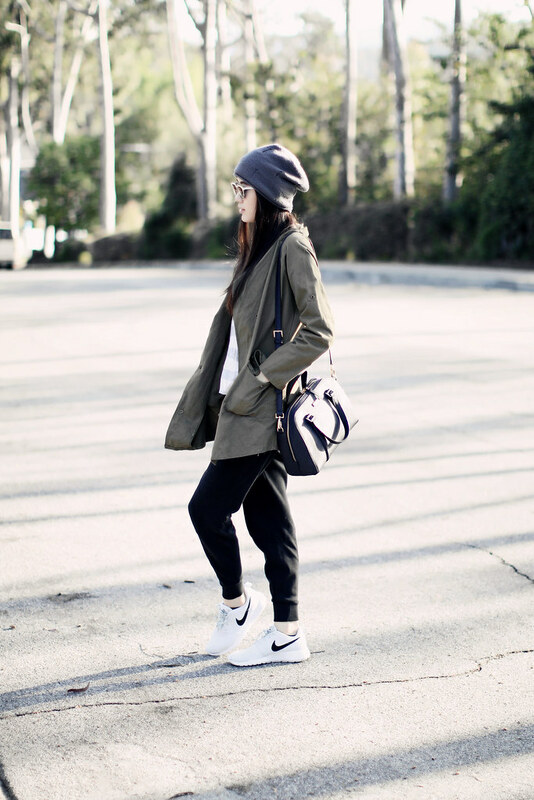 Love your Nike and this casual/comfy look! Haha thank you so much Clarissa ❤ I'm glad you like this off-duty look 🙂 It's one of my faves too! I’ve never really celebrated st patrick day before, though I live in Europe haha! 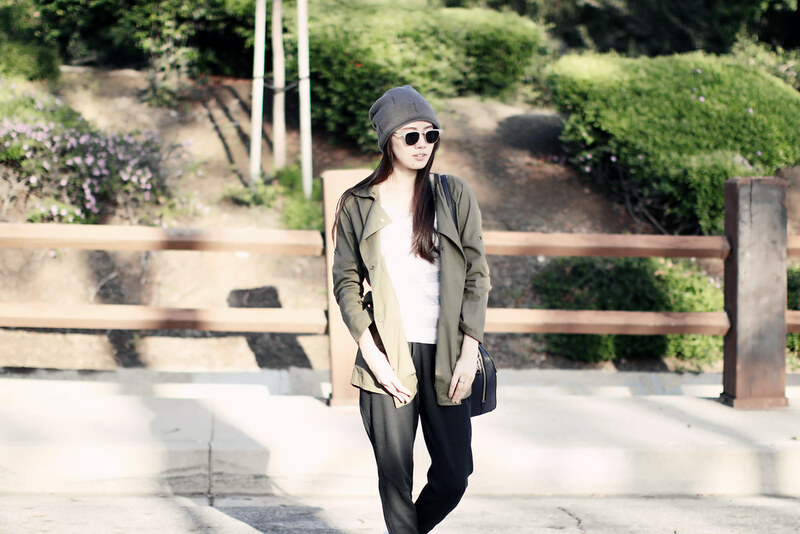 I’m not much of a green fan, but when it comes to olive or military jacket, I’m all in! love this outfit Elizabeth, the beanie looks adorable on you 🙂 have a great week! Hahaha I’ve never really celebrated it too, Tiffany, so I know how you feel 😛 And I definitely agree – when it comes to olive green, I’m all in 😀 ❤ Thank you so much for your kind words! Hope you're having a great week as well! Completely forgot about St Patty’s Day so missed the green bandwagon, I did, but no matter, I get to live vicariously through the sartorial choices of others such as yourself 🙂 I do love me a good utility jacket and yours certainly rocks, Elizabeth. Hahaha it’s okay, as long as you didn’t get punched by others Sheela 🙂 Thank you so much for stopping by, and I’m glad you liked the utility jacket too! It’s one of my current faves! Love your outfit! So chic! Thank you for stopping by love ❤ The Nikes are my favorite sporty shoes lately! 🙂 I love how versatile they are and how they match with so many different outfits! I’ve never been super into green clothing either, but I never considered olive! You make it look so model-off-duty chic here that I might have to try it! Me too! Haha I never really thought much of green, but lately, olive’s definitely been at the top of my list ❤ I love how versatile it is 🙂 And aww thank you so much love! You're too sweet! Hope you'll like olive green as much as I do! Like you, I never used to wear green just because I tend to shy away from colours, but I’ve recently realized how strong and beautiful shades of green like the one you’re wearing are. 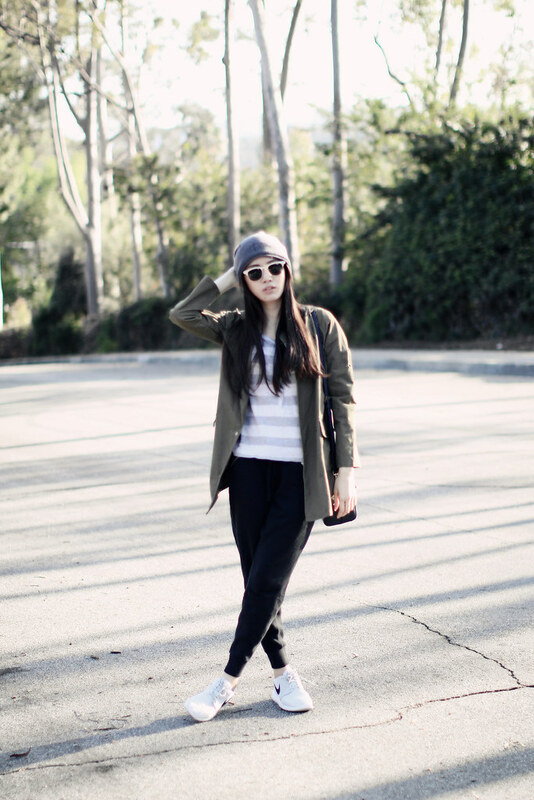 I especially love them in the form of utility jackets, too! Haha I know exactly how you feel May ❤ Green has never really been my choice of color, but lately I've been loving olive so much 🙂 I've been reaching for it almost every other day! Love this look, especially the kicks!